3.5x4 Custom Magnets - Outdoor & Car Magnets 55 Mil Square Corners are one easy and impressive way to advertise your business to everyone in the town. Just place these custom magnets on cars or any metal surface in the outdoors to get the attention of everyone passing by. Utilize our full color processing and free design facilities to place your brand information into these heavy and durable outdoor magnets that are Made In USA. We offer free shipping in the Contiguous USA. Order outdoor safe custom rectangle and square magnets right now to get our lowest price guarantee and no set up fee offers. 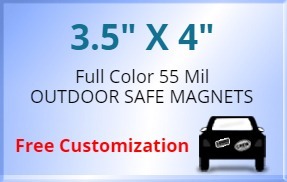 Request a quote to know the value savings that you can avail on bulk orders of 3.5x4 Custom Magnets - Outdoor & Car Magnets 55 Mil Square Corners.